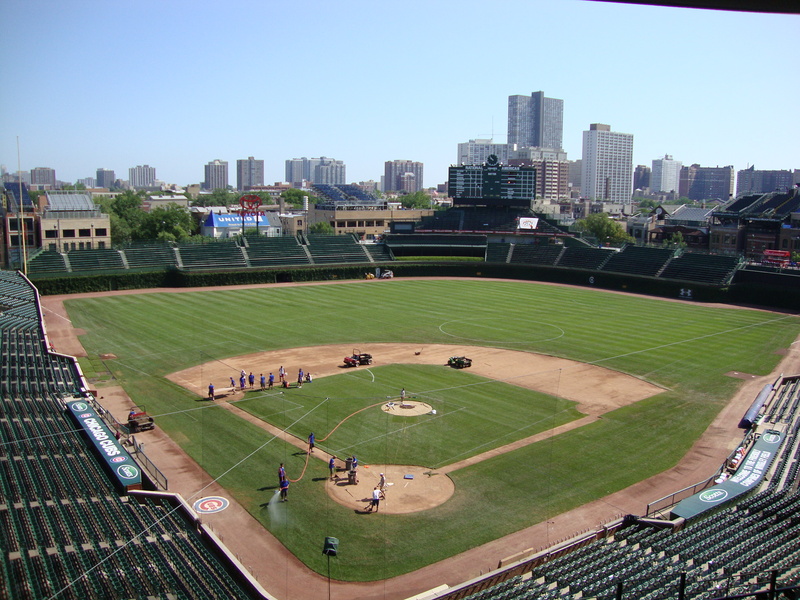 and Wrigley Field, home of the Chicago Cubs. This is a view from the press box. 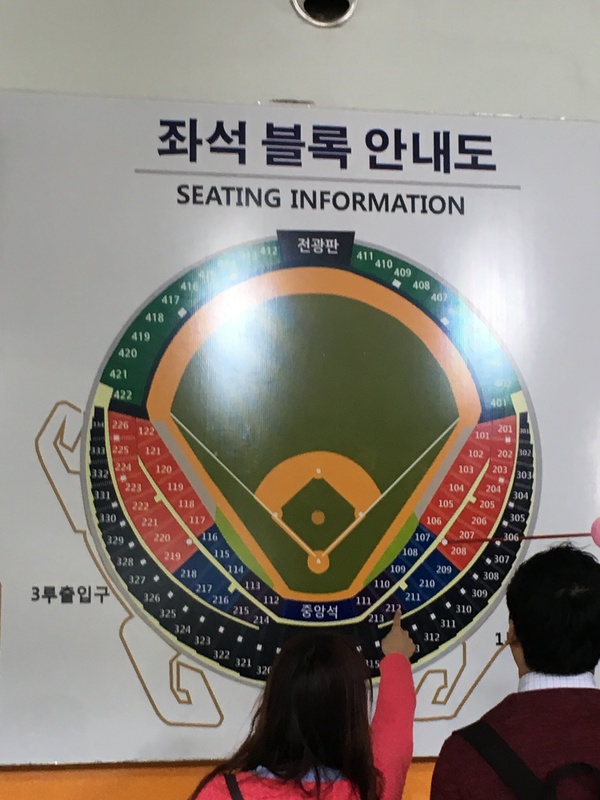 So when my daughter asked me if I wanted to go to see a baseball game in Seoul with her and several of her friends, the answer was YES! 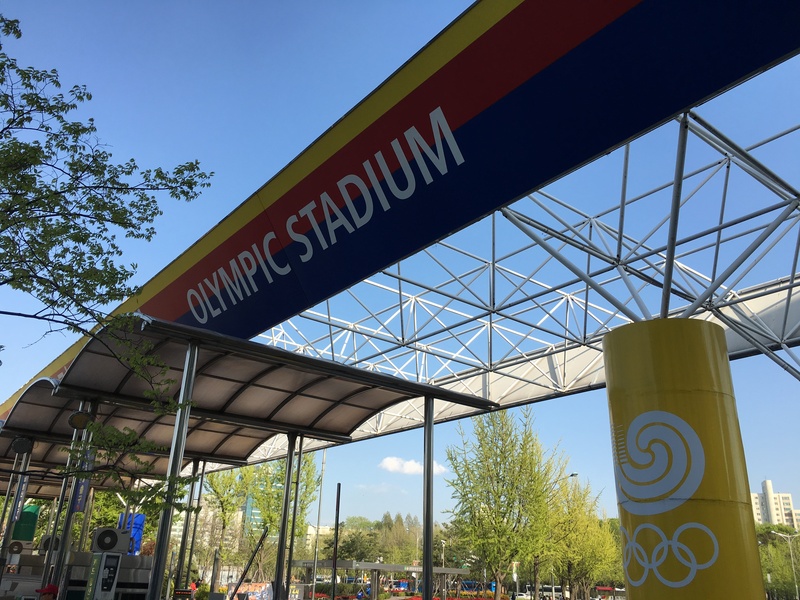 The stadium is in located in the Olympic Park that was built for the 1988 Summer Olympics. 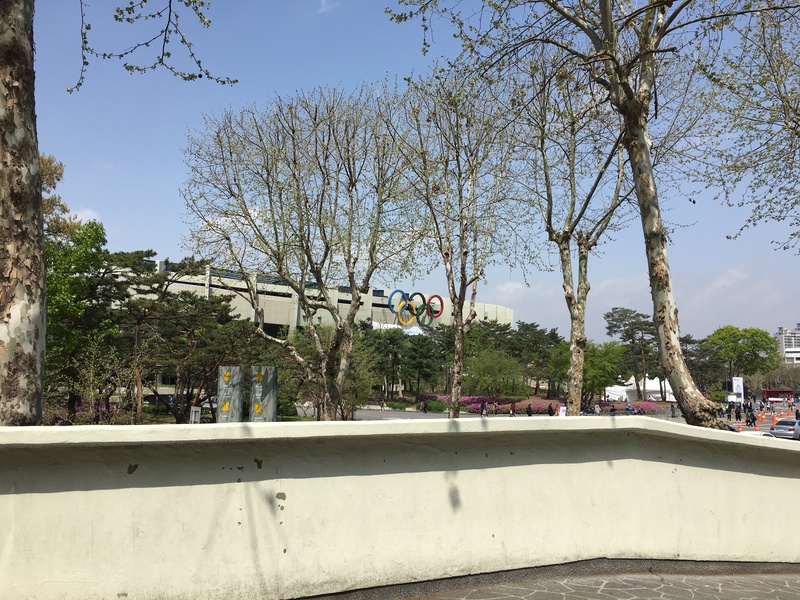 We took the subway from Seoul to Jamsil Stadium. Outside the stadium, there were food vendors, lots of food vendors with pre-packed bags of food. Big bags of food….think grocery size paper bag…big bags of food. Although there is food inside the stadium, most people were buying food and drinks outside. KFC was our food of choice, so we bought chicken…my chicken strips were enough to feed several people! (again…no pictures!….what was I thinking??) 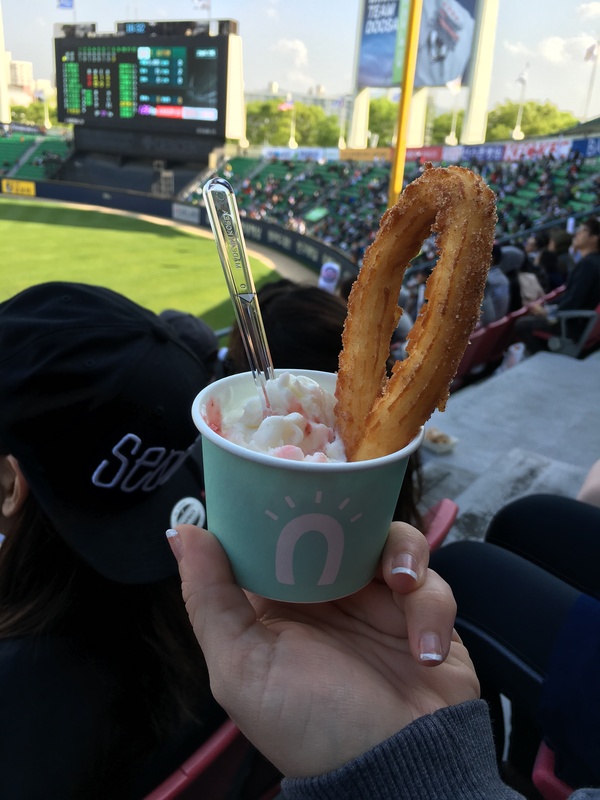 One of my daughter’s friends wanted a hot dog, which you can easily find at every stadium in the US, but is not common in Korea. However there was a small stand that sold French fries…and they had hot dogs too! Score! 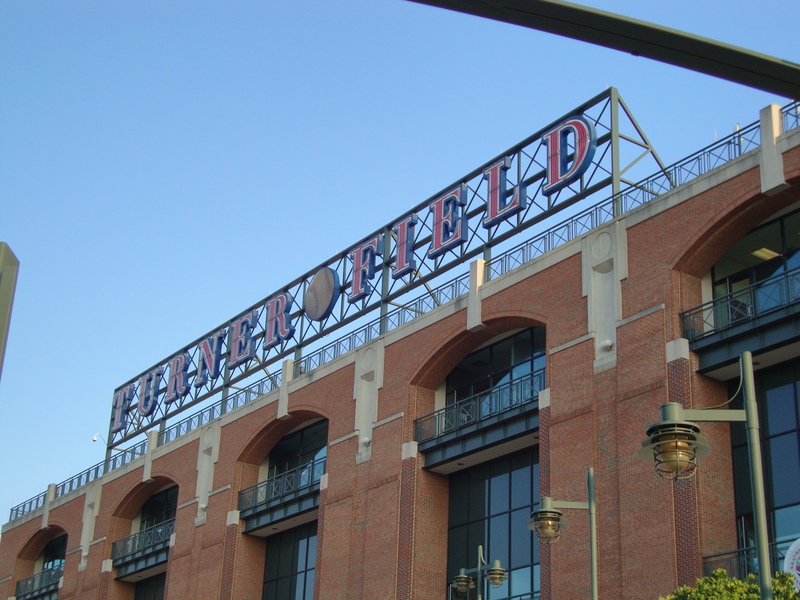 Now to enter the stadium. 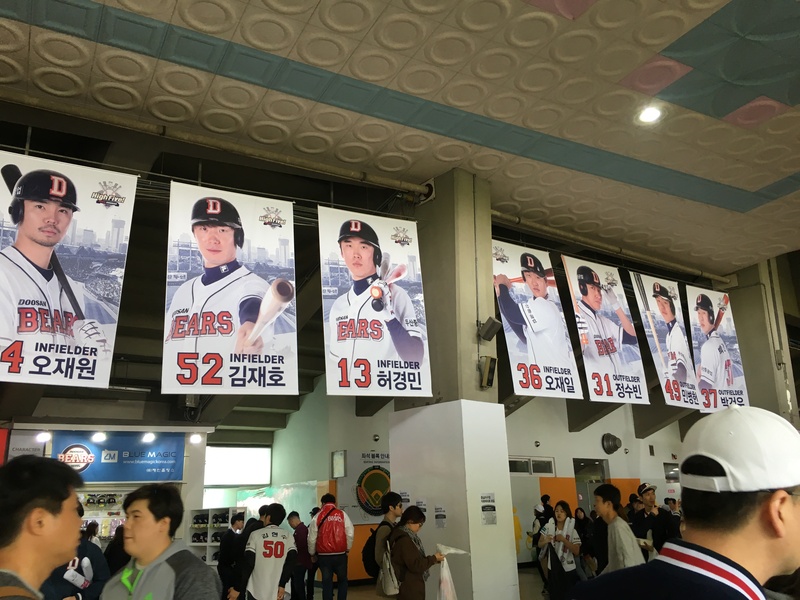 The game was between the Doosan Bears, one of three teams in Seoul and the Samsung Lions from the city of Daegu. 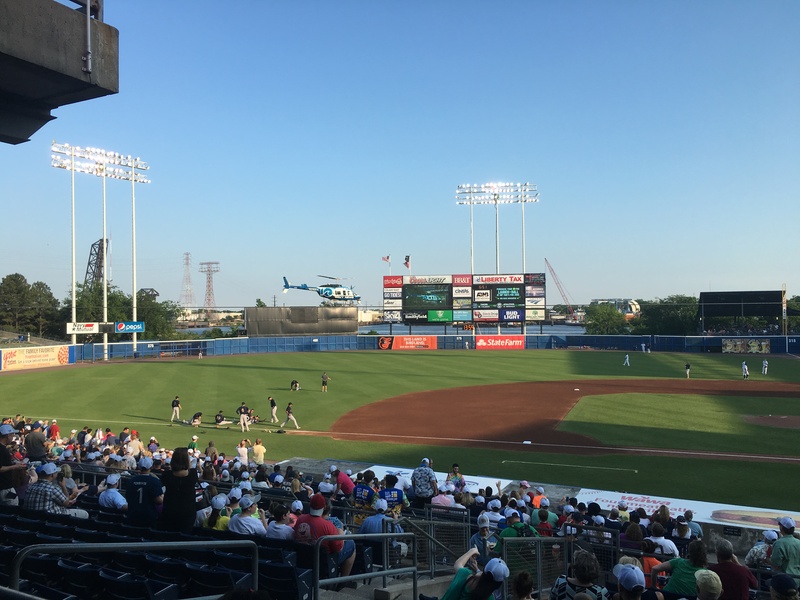 Unlike in the US where the baseball teams have the city where they are from in the name, the baseball teams here are all sponsored by businesses. 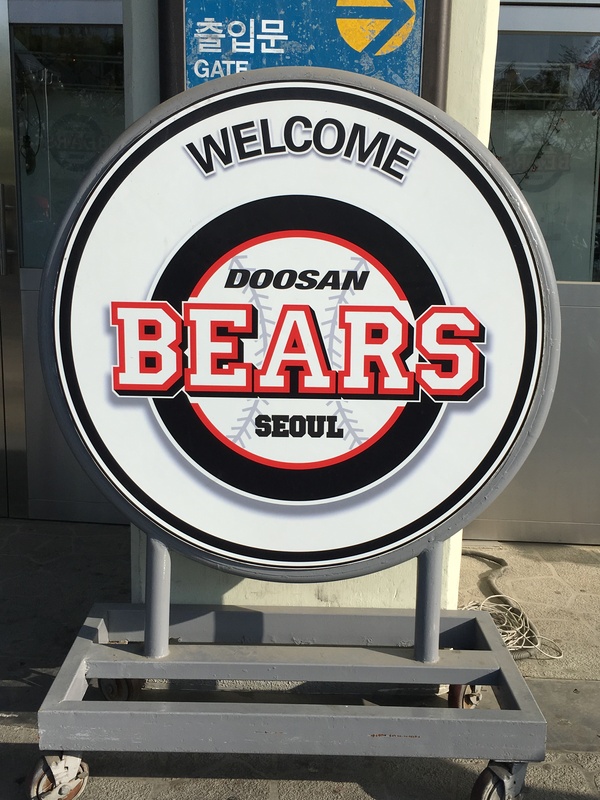 Doosan is a large construction equipment company and they are the owner/sponsor of the Doosan Bears. We were rooting for them to win. 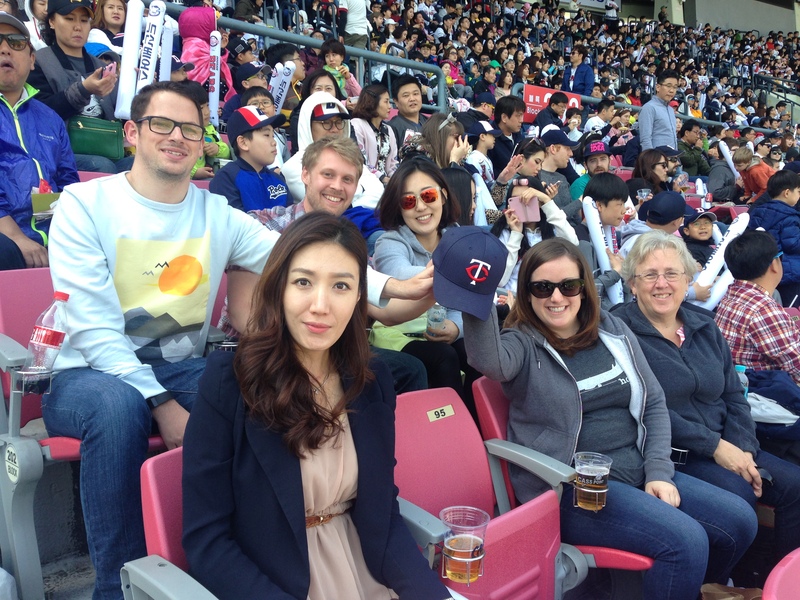 Going to a Korean baseball game is quite the experience, nothing like going to a baseball game in the USA. It’s more like a cross between a football game and a baseball game. 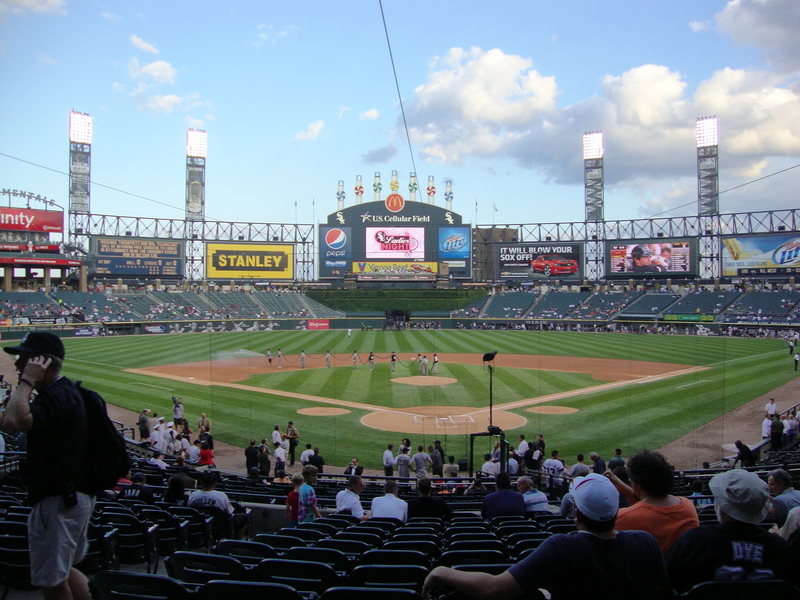 The game of baseball is played, but the fans are cheering like at a football game. They are enthusiastic, loud, and really get into the spirit of the game….with the help of the cheerleaders. Yes, cheerleaders. There is a special platform built in the stands just for the cheerleaders and their sound equipment. 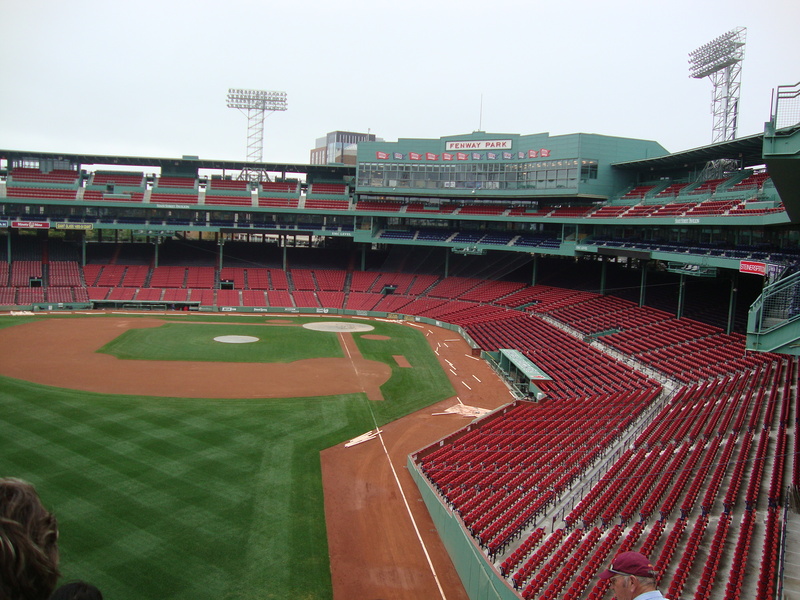 There are two platforms actually…one on each side of the stadium…one for each team. The “head cheerleader” for lack of better word has a microphone and leads the crowd in chanting, singing and cheering. You can see him on the screen below. He is helped by the four young women cheerleaders who dance along and help lead the crowd in all the hand motions. 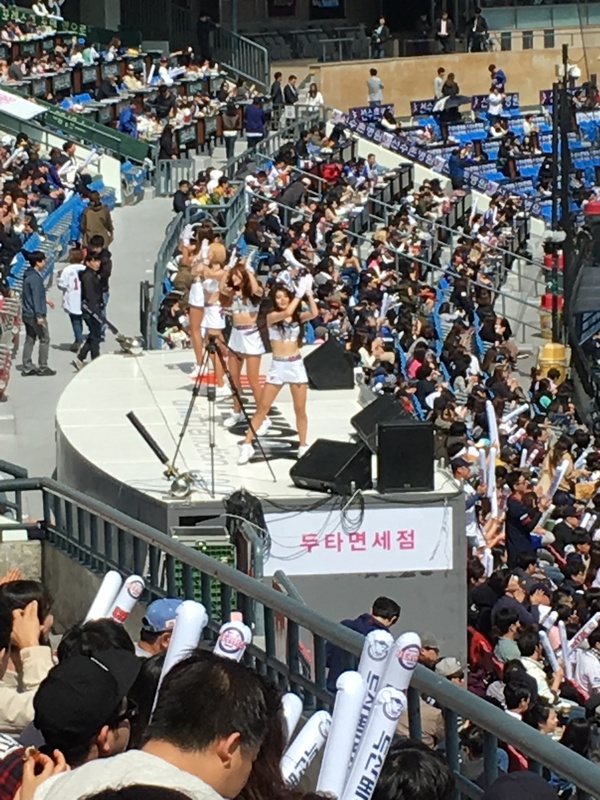 Although I think they are just for show, the fans didn’t need much encouragement to cheer and sing along. 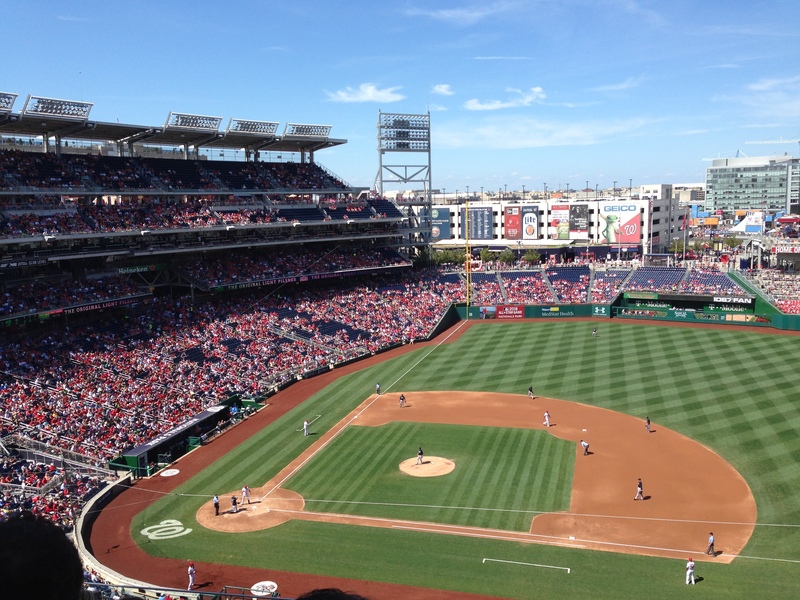 When their team is at bat, the fans cheer THE ENTIRE TIME. Each player has his own “song” and when the players are at bat, the crowd sings and waves their “thunder sticks” in time to the music. It was interesting to hear the music to the Beach Boys’ “Surfing USA”, but sung in Korean (and not the actual words to the song, but words that include the player’s name.) 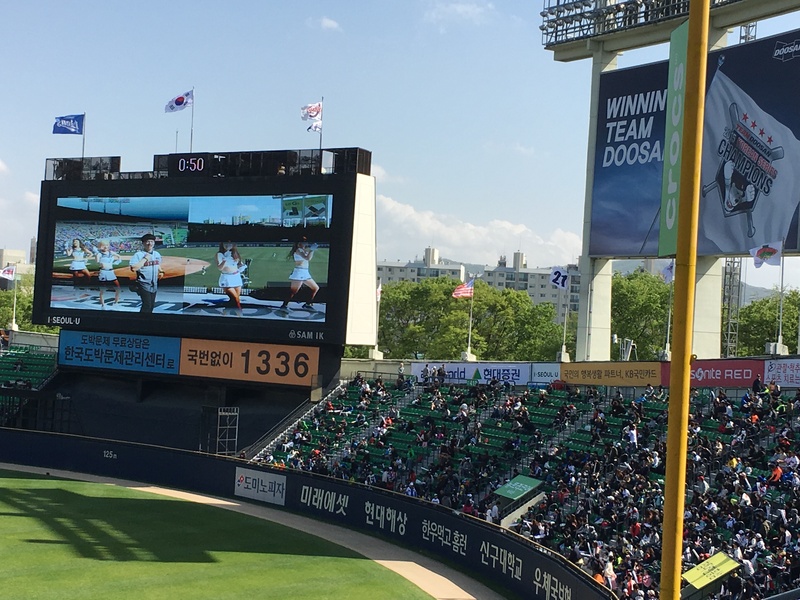 The cheering/singing only stops when the other team it “at bat” and then the opposing team’s cheerleaders take over with their own set of songs and chants and the other side of the stadium starts rocking with noise. Here is our little group of fans. (Maria and her friends are holding the hat in the place for their friend who is taking the picture.) 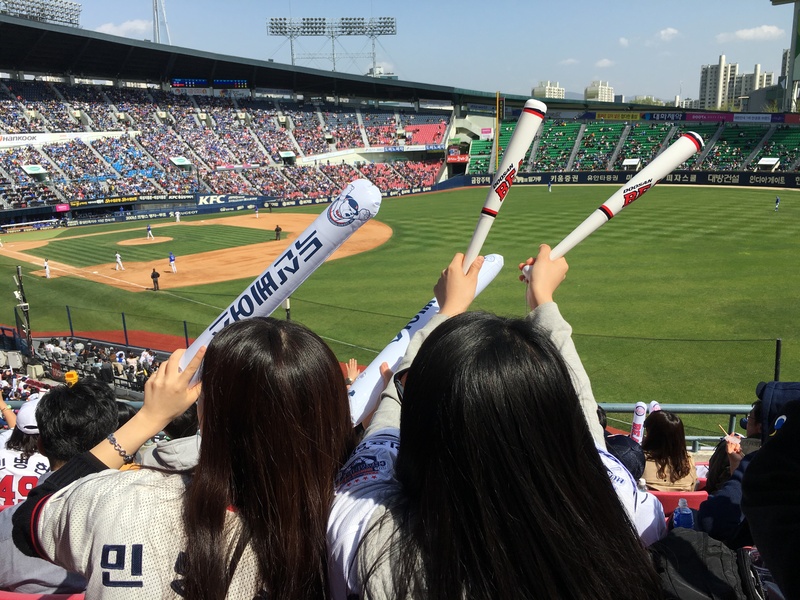 I think I spent most of the game, not watching the players, although the Doosan Bears won the game 6-2, I think), but watching the fans….and trying not to get beaned by the exuberant thunder stick and bat waving of the fans that were seated in front of us. By the end of the game, I was wishing that we had some thundersticks too just so I could join in the fun. Even though we did bring in way too much food to eat when we came…we did take the time to have a little dessert. A Churro with vanilla ice cream with strawberry topping….so very Korean (haha). it was yummy!